The Lord hath laid on Him the iniquity of us all. – Isaiah 53:6. Thus did Isaiah prophesy concerning Christ, the promised Messiah. He spoke as if these things were then already accomplished. Of course, today they stand as having been fully accomplished. The Lord did lay “on Him the iniquity of us all”, and we are free and saved eternally. These are the glad tidings brought to us now. But how few there are that believe these glad tidings! Many are offended at Christ Crucified. Flesh and blood, in looking at Him, behold no form nor comeliness, no beauty such as they would rather see. He is despised and rejected of men, a man of sorrows and acquainted with grief. Man, as it were, hides his face from Him; natural man esteems Him not. Yet the Lord laid on Him the iniquity of us all. Surely He has borne our griefs, and carried our sorrows. He was wounded for our transgressions, He was bruised for our iniquities. The chastisement of our peace was upon Him, and with His stripes we are healed. 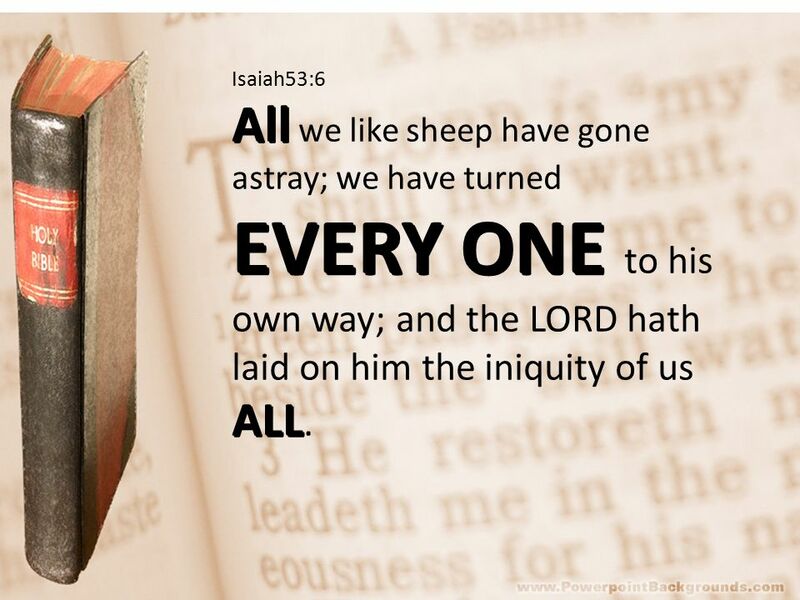 We are all as sheep gone astray; but the Lord has laid on Him the iniquities of us all. He was the blameless and patient Lamb of God that bore the sins of the world. It pleased God so to bruise Him. He has made His soul an offering for sin. They who are born of God know this, and behold this, and delight in it. And even He, our Savior, delights in the congregation of believers which has sprung from His sowing of blood and from the travail of His soul. By His knowledge He – the righteous Servant of God – justifies many; for He bore their iniquities. Despite the unbelief of many, the portion of His spoil is large, His victory is great, because He has poured out His soul unto death, and was numbered with the transgressors, and bore the sin of the world, and made intercession for the transgressors. – And you, too, O Christian, share in the victory of His vicarious work of redemption. Your sin, also, did the Lord lay upon Him. PRAYER. – I give thanks to Thee, crucified Redeemer, because Thou didst bear my sin, and didst make me righteous in the sight of God. I thank Thee for the blood Thou didst shed and for Thy death on the cross. When I contemplate this, my soul is delighted in Thee. For this is my salvation. I thank Thee that – through Thy most precious Gospel – Thou didst pluck me, a poor sinner, from out of the unbelieving world, and through faith in Thee, didst make me a portion of Thy spoil, having made satisfaction for all my sins. I trust and rejoice in Thee, dear Jesus! Amen. He becomes the Lamb that taketh sin away, and for aye full atonement maketh. For our life His own He tenders, and our race, by His grace, meet for glory renders. Let me in my arms receive Thee; on Thy breast let me rest, Savior, ne’er to leave Thee. Since Thou hast Thyself presented now to me, I shall be evermore contented.